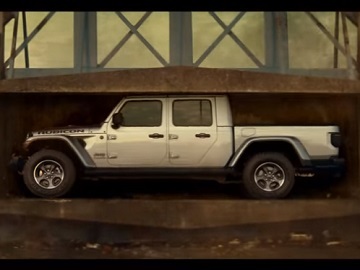 Jeep has released its Super Bowl commercial, showcasing the all-new 2020 Jeep Gladiator. Titled “Crusher,” the ad is set in a junkyard and features a 1963 Jeep Gladiator (which was sourced via an online scrap sales site, according to the automaker) being placed in a car crusher. As the industrial device starts to crush the truck, things take an unexpected turn – the Gladiator doesn’t get flattened, but instead it grows stronger and stops the process, damaging the crusher. Finally, the all-new Jeep Gladiator takes the place of the old Gladiator and the line “Gladiator is back” flashes across the screen. The soundtrack music is the 2009 single “How You Like Me Now?” by English rock band The Heavy, from their second studio album, “The House That Dirt Built”. The song, which became the group’s most famous song to date, samples the 1969 single “Let a Woman Be a Woman” by American funk band Dyke and the Blazers. The automaker states that the 2020 Gladiator, featuring legendary Jeep 4×4 capability, is “the only open-air pickup truck in the industry” and has been engineered from the ground up to deliver Best-in-class towing of up to 7,650 pounds and Best-in-class payload of up to 1,600 pounds. Its interior boasts leather-trimmed seats, innovative storage solutions, the Largest-in-class 8.4-inch touch screen on the Uconnect 4C NAV with Apple CarPlay support and Android Auto integration, Industry-Exclusive removable Bluetooth wireless speaker and more. The Gladiator range includes four trims – Sport, Sport S, Overland and Rubicon.